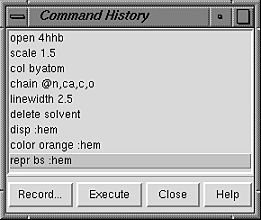 The Command History lists the commands that have been used since Chimera startup; all or a chosen subset of these can be executed or saved to a file. The Command History can be opened from the pulldown menu of recent commands next to the Command Line. Individual commands or blocks of commands may be chosen (highlighted) using the left mouse button. Ctrl-click adds to an existing choice rather than replacing it. To choose a block of commands without dragging, click on the first (or last) and then Shift-click on the last (or first) in the desired block. The choice of a single command, but not a block of commands, can be moved up and down the list using the keyboard up arrow and down arrow or Ctrl-p and Ctrl-n.
Record... brings up a dialog for saving the chosen commands to a new file or appending them to an existing file. Either the commands or their Python translations can be saved. A command file can be helpful when the same set of commands will be used repeatedly. Execute executes the chosen commands in the order shown; double-clicking an individual command executes that command.